We are proud to announce that we have officially launched the Bihar Innovation Lab (BIL), a project that we have been working tirelessly to realize ever since the idea was first born at the maiden Design Public Conclave in Delhi last year. We talked then about this revolutionary concept, of a lab that could change the face of healthcare and rural innovation in Bihar, and now little over a year later, are very pleased to announce that this collaborative initiative between the State Government of Bihar, the Bill and Melinda Gates Foundation and the Center for Knowledge Societies has been realized. 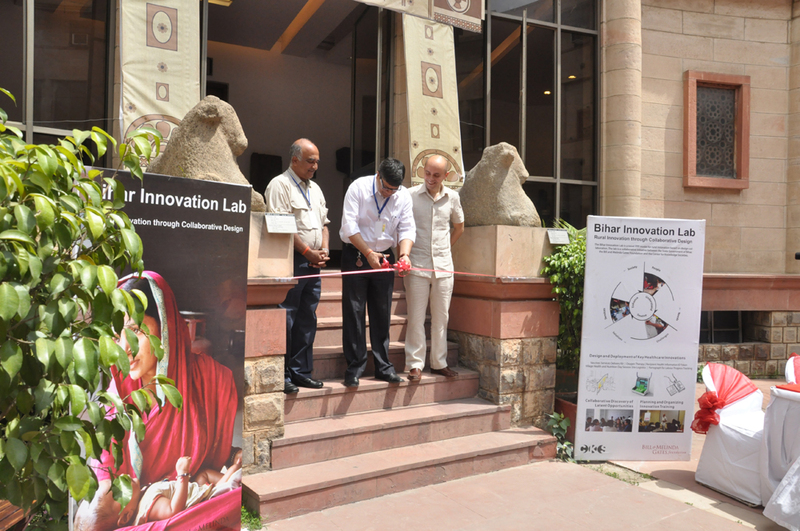 The Bihar Innovation Lab is a novel Public Private Partnership model for rural innovation based on design collaboration. It will be the first designated environment in India entrusted with the task of design led rural innovation, to drive new products and better service delivery mechanisms and to demonstrate how the quality of service is improved using design. The Lab will enable collaboration amongst various partners of the Foundation such as (but not limited to) Care, BBC World Services Trust, World Health Partners and CKS, and collaboratively discover latent innovation opportunities aimed at improving the quality of healthcare services. The Lab will also offer innovation training, by planning and hosting knowledge sharing seminars and capacity training with Partners and the Government Staff so as to accelerate the spreading of innovation techniques. â€œOver the years Bill and Melinda Gates Foundation has developed an understanding that health innovations around the world cannot come through without Impatient Optimism, and this is the best way to achieve this kind of work we hope to accomplish. We, along with the Government of Bihar, have a larger vision for a healthier and more developed Bihar,â€ said Mr. Ashok Alexander, Director of Avahan, Bill and Melinda Gates Foundation. Over the coming months, we will be busy preparing the Lab, and look forward to sharing more stories about rural innovation in healthcare and other sectors once it is fully operational. Ayesha Vemuri is responsible for thought leadership and outreach efforts at CKS. She has undergraduate degree in Visual Art from Reed College in Portland, Oregon, where she also studied such varied subjects as biology, literature and the humanities. At CKS, she is responsible for curating the Design Public blog, managing our various social media platforms, organizing Pecha Kucha Nights and contributing to the intellectual content of the Design Public Conclave and other CKS initiatives. Find her on twitter at @ayeshavemuri. This entry was posted in Design!publiC, Interesting Ideas. Bookmark the permalink. This is a great initiative Sir.